Nerves are the “telephone wiring” system that carries messages from the brain to the rest of the body. A nerve is like a telephone cable wrapped in insulation. An outer layer of tissue forms a cover to protect the nerve, just like the insulation surrounding a telephone cable (see Figure 1). A nerve contains millions of individual fibers grouped in bundles within the “insulated cable.” Nerves serve as the “wires” of the body that carry information to and from the brain. Motor nerves carry messages from the brain to muscles to make the body move. Sensory nerves carry messages to the brain from different parts of the body to signal pain, pressure, and temperature. While the individual axon (nerve fiber) carries only one type of message, either motor or sensory, most nerves in the body are made up of both. Nerves are fragile and nerve injury can be caused by pressure, stretching, or cutting. Pressure or stretching injuries can cause the fibers carrying the information to break and stop the nerve from working, without disrupting the insulating cover. When a nerve is cut, both the nerve and the insulation are broken. Nerve injury can cease the transmission of signals to and from the brain, preventing muscles from working and causing loss of feeling in the area supplied by that nerve. When nerve fibers are broken, the end of the fiber farthest from the brain dies, while the insulation stays intact, leaving empty tubes which used to carry the nerve fibers. The end that is closest to the brain does not die, and after some time may begin to heal. If the insulation was not cut, the nerve fibers may grow down the empty tubes until reaching a muscle or sensory receptor. If both the nerve and insulation have been cut and the nerve is not fixed, the growing nerve fibers may grow into a ball at the end of the cut, forming a nerve scar called a ‘neuroma’. A neuroma can be painful and cause an electrical feeling when touched. Figure 1. Nerve with bundles of individual nerve fibers and surrounding outer sheath ("insulation"). Figure 2. Nerve repair with realignment of bundles. To fix a cut nerve, the insulation around both ends of the nerve is sewn together. A nerve in a finger is only as thick as a piece of thin spaghetti, so the stitches have to be very tiny and thin. The repair may need to be protected with a splint for the first 3 weeks to protect it from stretching apart since it is so delicate. 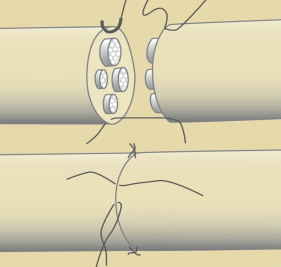 The goal in fixing the nerve is to repair the outer cover so that nerve fibers can grow down the empty tubes to the muscles and sensory receptors and work again (see Figure 2). The surgeon tries to line up the ends of the nerve repair so that the fibers and empty tubes match up with each other as best as possible, but with millions of fibers in the nerve, not all of the original connections are likely to be re-established. If a wound is dirty or crushed, your physician may wait to fix the nerve until the skin has healed. If there is a gap between the ends of the nerve, the doctor may need to take a piece of nerve (nerve graft) from another part of the body to fix the injured nerve. This may cause permanent loss of feeling in the area where the nerve graft was taken. Smaller gaps can sometimes be bridged with “conduits” made from a vein or special cylinder. Once the nerve cover is fixed, the nerve fibers generally begin to start growing across the repair site after three or four weeks. The nerve fibers then usually grow down the empty nerve tubes up to one inch every month, depending on the patient’s age and other factors. This means that nerve injury in the arm 11 or 12 inches above the fingertips, it may take as long as a year before feeling returns to the fingertips. The feeling of pins and needles in the fingertips is common during the recovery process. While this can be uncomfortable, it usually passes and is a sign of recovery. The patient should be aware of several things while waiting for the nerve to heal. Your doctor may recommend therapy to keep joints flexible. If the joints become stiff, they will not work even after muscles begin to work again. When a sensory nerve injury occurs, the patient must be extra careful not to burn or cut their fingers since there is no feeling in the affected area. After the nerve has recovered, the brain gets “lazy,” and a procedure called sensory re-education may be needed to improve feeling to the hand or finger. Your doctor will recommend the appropriate therapy based on the nature of your injury. Factors that may affect results after nerve repair include age, the type of wound and nerve, and location of the injury. While a nerve injury may create lasting problems for the patient, care by a physician and proper therapy help return to more normal use.